It's the classic line when those who have walked away from the Oscars empty handed are asked about how they’re feeling. And it is. But even if Leo DiCaprio doesn’t walk out of the ceremony on March 2 holding a little gold man, he won’t be leaving empty handed. 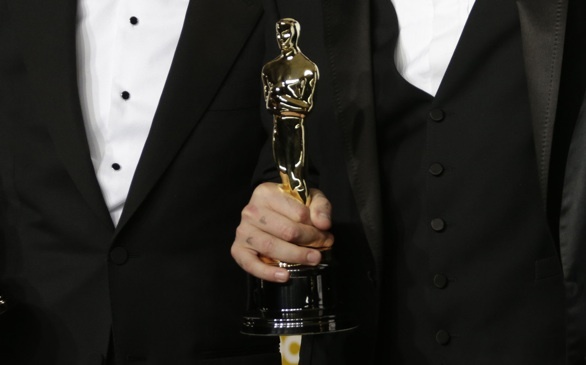 All of the Oscar nominees are given a gift basket by L.A.- based marketing firm Distinctive Assets. And this ain’t your run-of-the-mill scented candles and flowers gift basket. As would be expected, the nominees get some expensive candies and wine to relieve some of the pain of losing (and personal training sessions to make it all disappear). But valued at a whopping $50,000 dollars, some rather interesting items are included in the basket as well. Slow Watch - It's a watch that has one hand and all 24 hours of your day on the face. It’s harder to stress about time quite as much when you can’t keep a close track of it, and this watch has been designed to allow you to see your whole day in a single glance. It features a sleek, minimalist design and retails for $290 dollars. His and Her Mace - Being a celebrity is apparently a dangerous game, one that seems to require protection. With this is mind, nominees are given his and her pepper-spray guns: hot pink for the ladies and camo for guys. Or vice versa. The nominees get two, so whatever goes with their outfit best, I guess. Valued at $120 dollars. Epic Pet Health - Awards show season apparently takes its toll on everyone in the household, including man’s best friend. The nominees' pets can be treated to year-supply of this customized spray electrolyte regimen designed to help improve their quality of life. Valued at $ 1,571.98. Polar Loop - Nominees can’t just sit around and wallow, even if they lose. Instead, they are gifted an activity tracker by Polar. They can wear it around the wrist, and it tells them when they've been sitting for too long. This nifty device can sync up with a heart rate monitor and examines your sleep patterns. Valued at $109.95 dollars. Best of Las Vegas - As if all this wasn’t enough, the stars are also given tickets to what seems to be quite the weekend in Vegas. The package includes tickets to see Boyz II Men (with a meet and greet), a penthouse suite at the Riviera, Chippendales tickets and the chance to visit Gold and Silver Pawn shop and be an extra on Pawn Stars. This package valued at more than $9,000 dollars. This article has been viewed 1580 times.